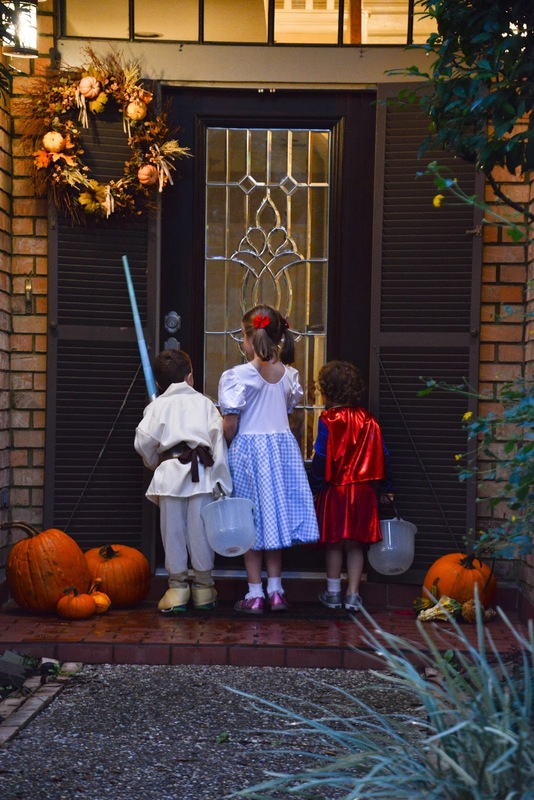 It poured down raining in Houston most of the day on Halloween, but fortunately it stopped a couple of hours before the evening trick-or-treating began. Audrey's school trick-or-treating at NASA that morning was cancelled due to the rain, but they still dressed up and got candy from their friends and teachers with a little indoor trick-or-treating of their own. Audrey was Sleeping Beauty for Halloween this year...until she decided to ruin her costume at school. Good thing we have a few dress up clothes! She quickly turned into Super Girl when we got home and was ready to go trick-or-treating! Jackson's class didn't get to dress up at school, but he gave everyone a clue of what he would be by wearing Star Wars t-shirts all week! His class did something called "Fall Centers." I took the afternoon off to help out, and it was a lot of fun! They had pumpkin bowling, monster making, Halloween necklace making, and cupcake decorating centers. I loved the chance to get to know some of his classmates better! He was quick to get into character when he got home too. He was Luke Skywalker this year! Our friends, the Fulliloves, joined us for trick-or-treating. Clara was Dorothy, and she brought her little dog too! Now that we know a few more of the kids in the neighborhood, walking around the streets was even more fun. Here's a pic from the first house they stopped at. It got dark soon after this, so I really didn't get many pictures this year. 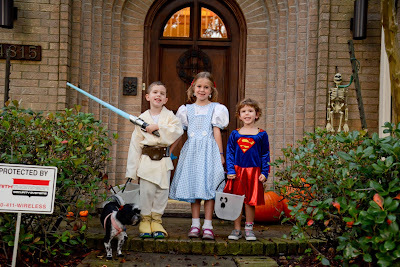 Their buckets were quickly full of candy after a short walk around our neighborhood, so we headed home. They loved handing out candy to the kids who came to our door. There were even a few scary ones that they didn't hide from this year. Jackson told one kid he should win the scariest costume award! It was a fun night!